FFXIV ARR Racial Stats and God stats guide. No more stressing out in character creation! We’ve compiled sortable tables of the race/stats and gods/resists. Also, our insights on choosing correctly! When choosing your character’s Race and God in FFXIV A Realm Reborn, it’s kind of annoying since we aren’t given a table view of what the differences are for each pick. See also: FFXIV A Realm Reborn Stats & Attributes Guide. The total stats of each race and subrace is equal at 120. Character customization can pretty erase all cosmetic distinction between subraces. Choose whatever you want! All races have a subrace which is more suited towards “Physical” classes, and a subrace more suted towards “Magical” classes. Ultimately, as long as you chose appropriately and build properly, the small differences in starting stats accounts for much less than a 0.5% difference end-game. So what are the decent choices? Pugilists, Gladiators, Lancers, Marauders (Monk Paladin Dragoon Warrrior) : Sea Wolves, Highlanders, Wildwoods, Seekers, and Plainsfolk. Conjurers, Thaumaturges and Arcanists (White Mage, Black Mage, Scholar, Summoner) : Hellsguard, Midlander, Duskwight, Keepers, Dunefolk. Archers (Bard) : Wildwoods, Seekers, Keepers, and Plainsfolk. Again, Each race has a subrace more suited to physical jobs, and a race more suitable to magic jobs. The recommendations above only serve as a general guideline. Since you can make one subrace almost look exactly like the other subrace, you might as well get the better stats. The other choice given to us (without a table comparison) is god choice. Your choice of god will give you small bonus Elemental Attributes. The total Elemental Attributes of each god is equal at 313. Each god pair has one high stat of 54, one secondary stat of 53, three tertiary stats of 52 and one neutral stat of 50. Even if we assume 1 point equals 1% damage, the difference between picking for a 54 versus a 50 is only 0.3%. So what are decent choices? All in all it seems right now that the choices for race and god are pretty much for flavor. However, there are some of us who want to squeeze every bit of juice out of our characters. Unfortunately, we do not have the kind of information right now to make a proper analysis on that. Is this a good thing? Yes, I think it is. It doesn’t force people to be a certain race when playing a certain class, and allows people to pick whatever kind of look they like. It prevents people getting called names just because they didn’t “pick” properly. **For Archiving purposes, we will be splitting this guide into two which will be found here(Racial Stat Info) and here(God Stat Info). We are more likely to update those two separate links. Also, updates on our knowledge of the stats here (General Stat Info). Either way, we will be working on better informed Race/Class/Job/God combinations, information on each Stat, and more on Elemental Attributes. Subscribe so you won’t miss out! How? Just follow or like us on Facebook / Twitter! Thanks! and see you on Eorzea! 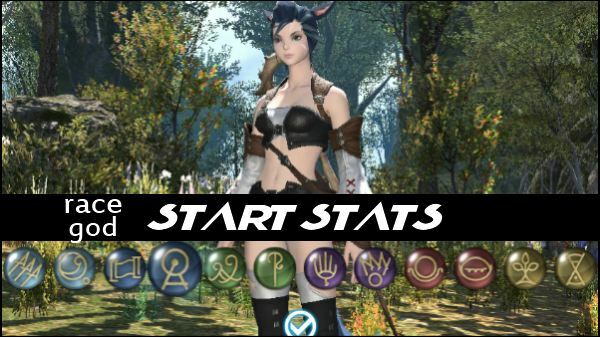 Author Mahiko SanPosted on June 21, 2013 April 12, 2018 Categories Featured, GuidesTags elemental attributes, elemental resist, god stats, gods, race, racial stats, starter guide, starting stats, stats16 Comments on FFXIV ARR Racial Stats and God stats guide. All our research on stats, and the effects on each class. Stay ahead of the game. We will update this regularly! Here, we will be discussing all the known stats and attributes found in FFXIV A Realm Reborn. Strength (STR) – Melee Physical Damage. Block & Parry AMOUNT. Dexterity (DEX) – Ranged Physical damage. Block & Parry CHANCE. Vitality (VIT) – HP Pool. Intelligence (INT) – Attack Magic Potency. Mind (MND) – Healing Magic Potency. In FFXIV ARR, stat points are obtained passively as you level up (which meld to what current class you’re using). You also gain 30 stat attribute points to spend at level 50. Still, the main source of stat points will be gear. Your primary stats have a direct effect on many of your secondary stats. I can see that some of these secondary stats can only be modified by gear or skills. For example, the Marauder skill Storms Eye reduces the targets resistance to slashing damage. Accuracy – Your chance to successfully land attacks. Critical Hit Rate – Your chance to critically hit. Determination – Affects damage dealt by all attacks and HP recovered by spells. Parry – Your chance to parry. Parrying reduces incoming damage by a certain percentage. Attack Power – Your overall physical damage capability. Skill Speed – Reduces recast time of weapon skills. Attack Magic Potency – Your overall magic damage capability. Healing Magic Potency – Your overall healing capability. Spell Speed – Reduces cast time of magical skills. GP – Increases GP, which allows you to cast gathering skills. Perception – Increases chance to gather high quality items. CP – Increases CP, which allows you to cast crafting skills. Craftsmanship – Increases the amount gained to reach a successful synthesis. Control – Increases the amount of quality gained when using “Basic Touch”. Fire – Reduce amount of Fire elemental damage taken. Ice – Reduce amount of Ice elemental damage taken. Wind – Reduce amount of Wind elemental damage taken. Earth – Reduce amount of Earth elemental damage taken. Lightning – Reduce amount of Lightning elemental damage taken. Water – Reduce amount of Water elemental damage taken. Upon character creation, these stats are represented by “elemental attributes”. This was kind of misleading because people assumed you could increase elemental damage if you chose the right god. However, across all characters created the God stats only seem to affect resists. 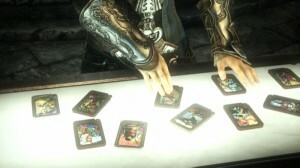 If speculation is true, this only affects Conjurers, Thaumaturges and Arcanists. (And the Dragoon final skill: Dragonfire Dive). Well, there’s still much to be learned, but we’re getting there. The better we understand these stats, the better recommendations for end-game character builds we can give. Needless to say, we’re working on it! Dont miss out on our most recent findings!, Subscribe today! It’s as simple as following us on Facebook or Twitter!